In a dramatic contrast to the frigid weather conditions experienced last week, everyone working at the South Adger’s Wharf dig today found themselves shedding layers of clothing and reaching for the sunscreen. The warm temperatures and bright sun helped create an energetic work site, and progress was made in three main areas today. First, archaeologists Martha Zierden and Ron Anthony from the Charleston Museum, joined by and Andrew Agha from Brockington and Associates, used hand trowels to clean up the east face of the initial trench created on Thursday, January 3d, in order to examine and document the many visible layers. 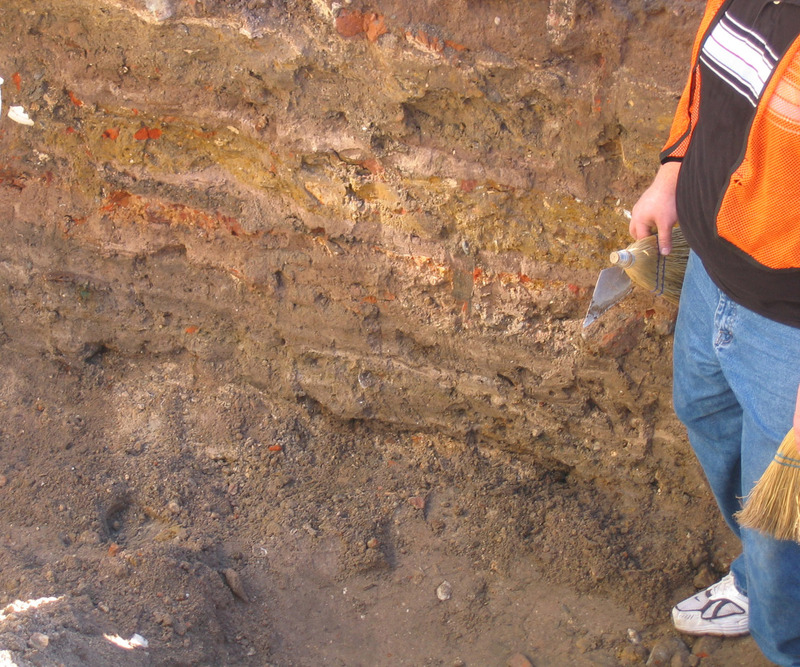 Understanding the various colors and textures of these layers is crucial, and with further study they will help the archaeologists to identify and date the many episodes of fill that created the modern street bed. 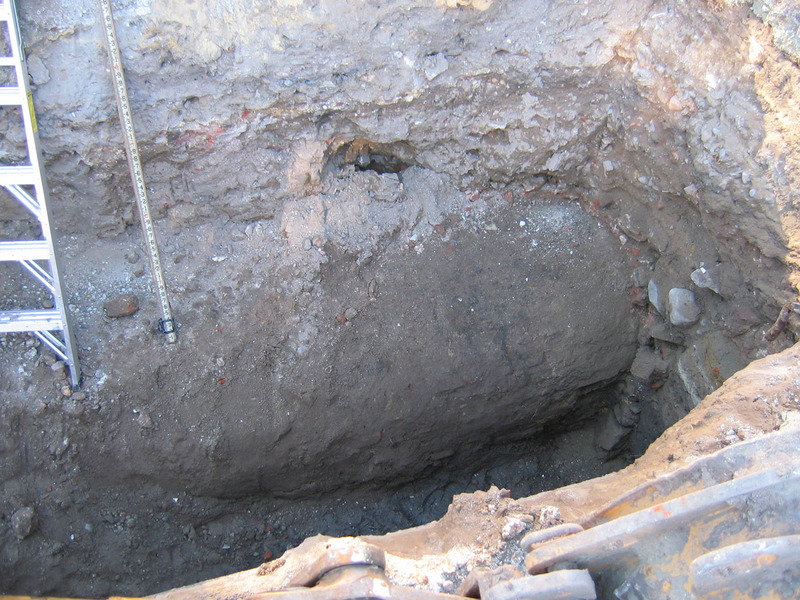 Second, archaeologist Eric Poplin troweled the east end of the second trench in order to study a rubble pit that is probably associated with the demolition of the “Lower Market” in 1800. 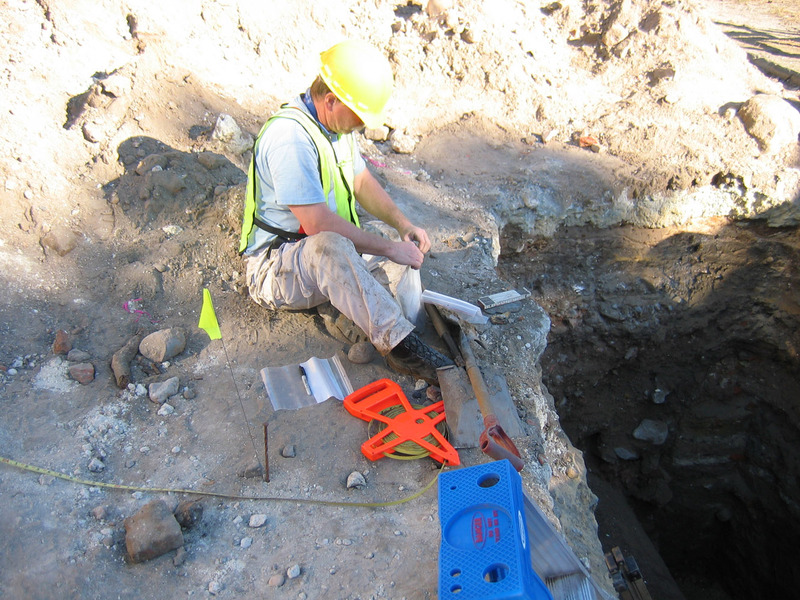 In addition, Eric has been exploring the outline of a deeply-buried arched brick drain that runs east-west through the site, and may date back to the colonial period. The massive brick remnants of the redan, uncovered last Friday at the west end of this trench, will have to wait another day for further close inspection. 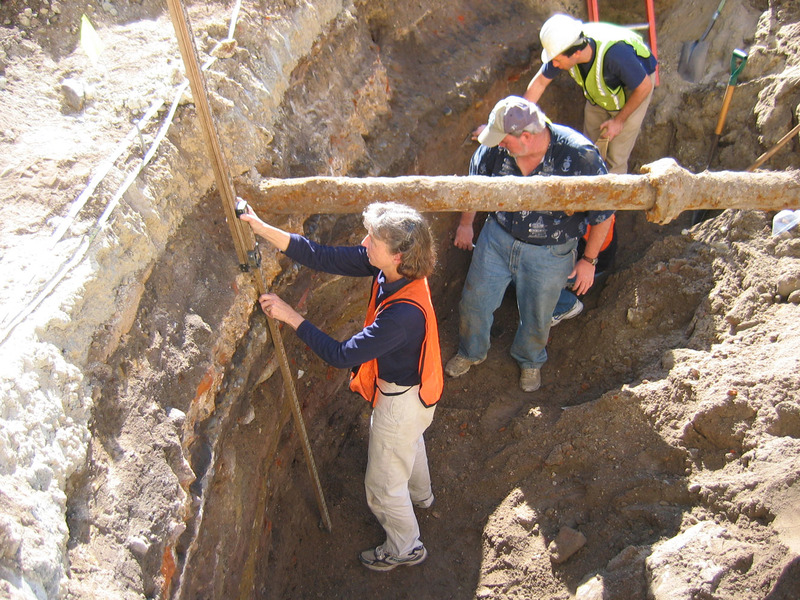 Third, a number of volunteers began screening excavated dirt for artifacts. A number of ceramic and glass fragments have been found so far, representing a wide variety of forms, types, and eras. Considering that part of this site was once used as a market, it is no surprise that a number of animal bones and oyster shells have been uncovered as well. My personal favorite artifacts found so far is a pair of old leather shoes—found separately—that some old soul may have lost in the pluff mud three hundred years ago! Further hand trowelwork and screening will continue tomorrow. On the surface it may seem that little progress was made today, but Martha Zierden remarked that she felt like the archaeological team had made substantial headway in understanding what has been uncovered so far. 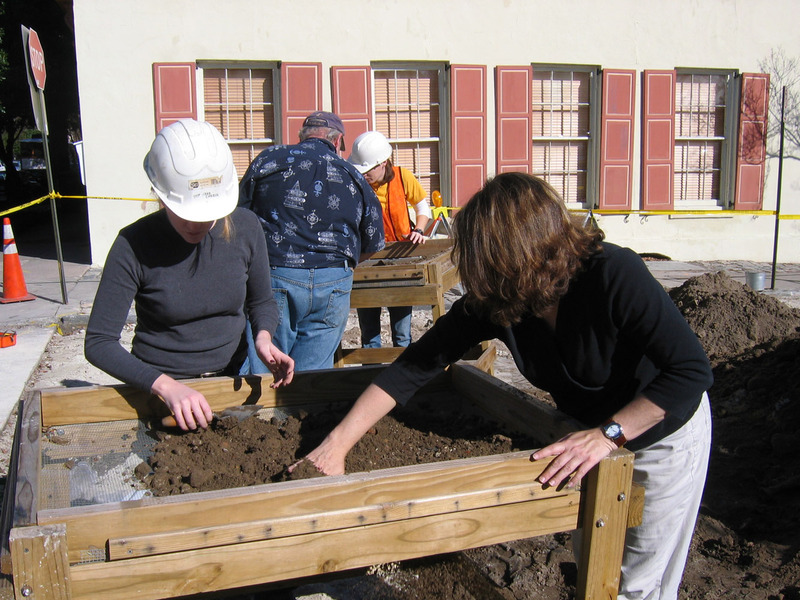 Volunteers will always be needed for screening artifacts from the dirt and for general assistance. If you’re interested in helping out, or in supporting the work of the Mayor’s Walled City Task Force, contact Katherine Saunders at (843) 723-3646, or email her at ksaunders[at]historiccharleston.org.